We’re officially in November! 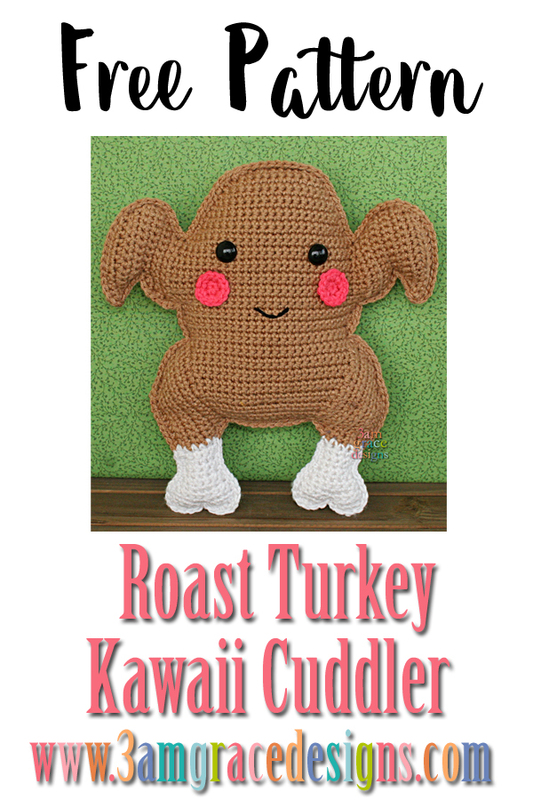 This little Roast Turkey Kawaii Cuddler makes us giggle every time we look at him! 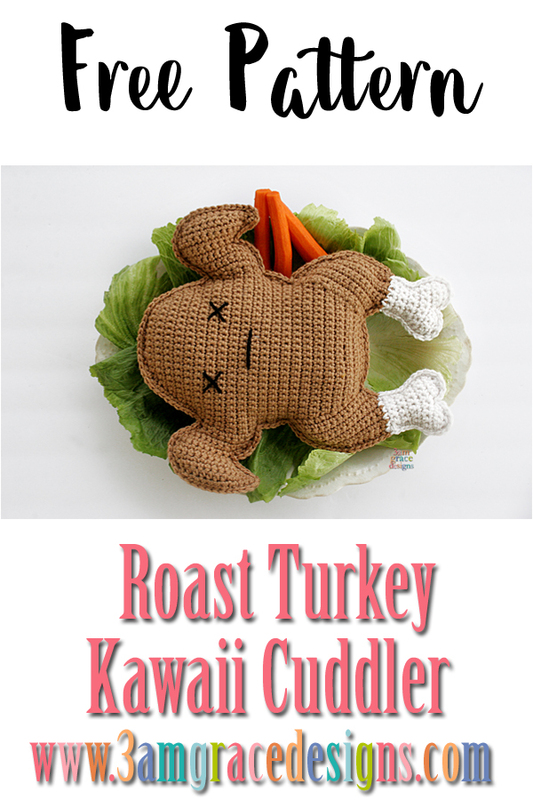 He’d make a perfect Hostess Gift for your Thanksgiving Host! We love the traditional Kawaii version as much as the um, bird on a platter version! We hope you enjoy making your very own Roast Turkey! We can’t wait to see your creativity. When you complete one, please post it in our Facebook group or tag us on Instagram #3amgracedesigns. We love seeing your work! * Turn work so the legs are pointing down, now your work is in the correct direction. * Place safety eyes in desired location approximately 11 stitches apart. 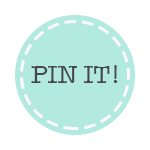 * Use yarn or puff paint to create mouth. *Align Roast Turkey halves so end of rows match. SC around both pieces to join together. If you want your edging to match, make sure you change colors as you SC around. Stuff with Poly-Fil prior to completing stitching. Make sure you work in a counter-clockwise direction so your stitches face forward. To make the adaption below, leave off Safety Eyes & facial features. Create desired eyes and mouth with black yarn or puff paint. Aww that makes us so happy! 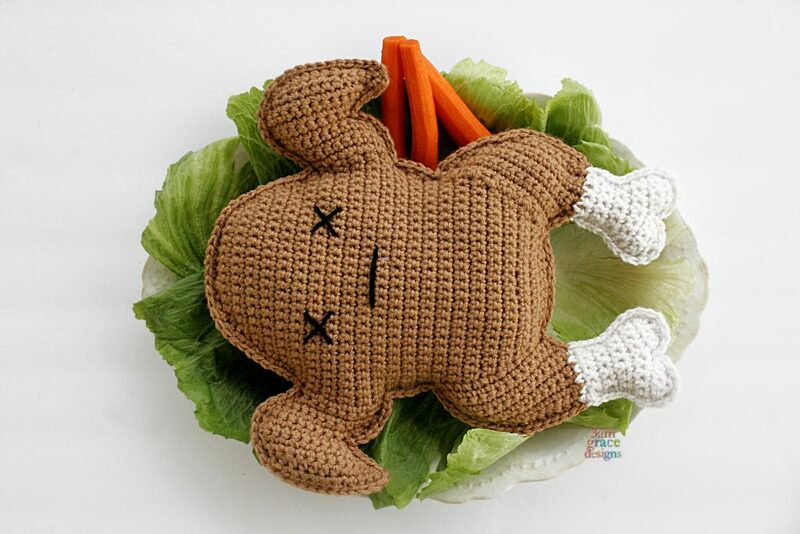 Be sure to post your finished Turkey in our Facebook Group! We love seeing them!